I was researching about new places to go in Bangkok at the last minute, and I came across the Siam Niramit show. 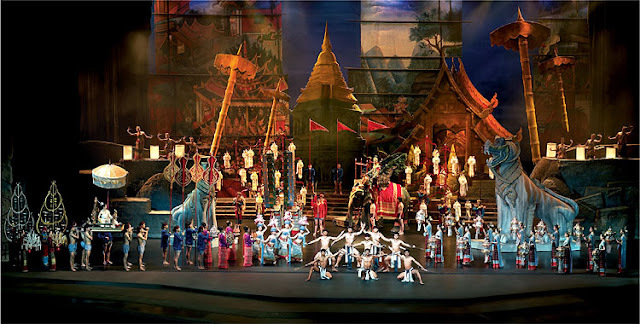 Siam Niramit is one of the largest stage productions in the world, and it chronicles Thai history. It actually has an award from the Guinness World Records for having the tallest arch in stage history. I hopped over to Tripadvisor to see reviews from people who watched the show. Most of them were good. A lot of people say it's one of the best and most spectacular shows they've seen in their whole life. They even compared it to the famous Cirque du Soleil. While a majority of the reviews were good, there were a few detractors saying the show was below their expectations. Getting to Siam Niramit was easy. Even though it was far from central Bangkok, we didn't have a difficult time getting there. We just took the MRT to Thailand Cultural Centre station. Upon exiting the train, you'll see several signs saying "Siam Niramit". We took the Siam Niramit exit and immediately we saw their marked van, waiting for passengers bound for Siam Niramit. Their shuttle buses are free, and start from 6pm to 745pm. We got to the venue, and the ticketing office issued our seats when we presented the printed online confirmation. We dropped by the buffet, and waited for the show to start. While you're waiting, girls in Thai costume will have your picture taken and sell it to you before the show. You can politely say no if you don't want to buy it. THe show started promptly at 8PM, and boy, we got very good seats! We were seated in row L in the middle of the theater, right behind the 2000 baht golden seats. We had a very good view of the stage, and it was a very grand one at that. It was the biggest stage I've seen. The show had 3 acts. The first act showed the diverse cultures that existed in ancient Thailand: The Ancient Kingdom of Lanna, Traders from Overseas, Heritage of the Khmer Civilization, and the Mighty Capital of Ayutthaya. It was indeed a spectacular show with more than 100 performers. Each stage in the act was intricately designed, and props were so big you'd wonder how you never noticed them changing the set. Aside from actors and actresses, they use live animals on the show as well. 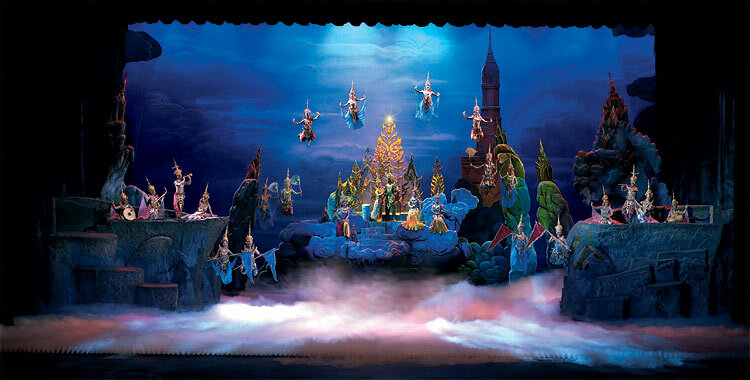 We saw elephants and goats as part of the scenes in Siam Niramit. Amazing, isn't it? Among all the acts, my favorite was the second one. It told the story of the three worlds all the cultures believed in: Fiery Hell, Mystical Himapaan Forest, and Blissful Heaven. It was in this act that we saw a man dive right into water at the stage, as if a pool magically appeared out of nowhere. Yes, there was indeed a pool that is part of the stage and in this act they even had actual flat boats wade through the water in the stage. It was also in this act wherein I saw several people suspended from the stage as they interpreted their concept of heaven. The show was very beautiful, and all the intricate details in their sets and costumes make the ticket price worth what it costs. The audience was so impressed that after every scene, they would give a loud applause for the show. I also loved how they did not limit themselves to the stage area. The performers would freely emerge at the aisles, and the audience would feel they're actually part of the show. They don't limit their effects at the stage too. I've seen bursts of fire a few meters from where I was seated, as if the stage suddenly expanded to include the entire theater. Once in a while, they will invite members from the audience to join them at the stage and provide amusing twists to their show. If you're interested to know more about Thai history, this is definitely a show to watch. It's amazing how they preserved their culture and how they can freely share it with their tourists. I'm glad we decided to watch this show, as I've had an amazing and unforgettable time in Siam Niramit. thank you for your entry. I learned a lot about getting there and purchasing tickets online.